Ensconced between Aguada foothills & a tiny hamlet Candolim lies this boutique beach resort "Whispering Palms-Goa" set up in the year 1992, offering a blend of Portuguese heritage & contemporary comfort. The poolside, brimming with colourful bougainvillea flowers is the focal point of this friendly resort. Live music is played on the terrace most evenings, making dining 'al-fresco' a truly delightful experience. 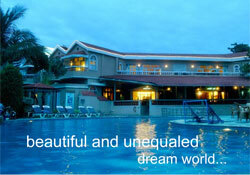 The accommodation is spacious and comfortable offering convenient access to the village of Candolim. Beach is a short walk from the hotel gardens. Lanai: The poolside eatery offers a choice of light meals, snacks and drinks all throughout the day. The revolving menus have been very hard swim or simple laze out in the sun. Service is available from 10.30 am till sunset. Sun & Palms: Sun & Palms the main multi cuisine patio restaurant overlooking the swimming pool makes up for a truly alfresco dining experience. The cuisine ranges from Continental, Indian, Chinese and truly Goan. Open for Breakfast, Lunch and Dinner. Crossroads: The laid back air conditioned pub serving the straight and exotic cocktails. With soft music in the background and the comfortable seating makes Crossroads a rendezvous for one and all throughout the day. Should the mood demand the pub converts itself to a full-fledged nightspot with latest pulsating music and polished parquet dance floor. Open daily from 10 am until whenever. Coffee Shoppe: A typical around the clock Coffee shop offering mini meals. Tucked off the Crossroads is this quaint little air-conditioned Diner. The 66 individually controlled air-conditioned Double / Twin bedded rooms ; comprising of Deluxe accommodation with attached bathrooms. The facilities include satellite television, individual telephones, refrigerator and private balcony / terrace.